What’s pop’n diesel dolls & dudes? I’m excited to announce that my brother-in-law Danny Kavadlo’s third book “Strength Rules” just dropped yesterday! 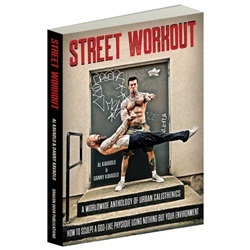 He’s the author of “Everybody Needs Training” and “Diamond-Cut Abs” –both classics in the Kavadlo bros ever expanding library. Strength rules is a phenomenal read because Danny’s unique style of writing is so good you can’t put the book down. He breaks down the myths surrounding strength training in a lighthearted and hilarious way, demystifying a lot of the propaganda surrounding the fitness industry. His “rules” are based around his philosophy that anyone can achieve strength and perfect health if they train consistently, eat healthy, surround themselves with positive influences, and are a positive force themselves. The book is loaded with a ton of beautiful full-color photos, and includes workouts for all levels, too! Highly recommend this book and you may even recognize yours truly in some of the shots! Click the link below to get your copy NOW!!! AVAILABLE IN E-BOOK AND PAPERBACK!